Raimo Radczewski is a freelancing software craftsman living in Berlin, Germany. He’s organizing Berlin’s Software Craftsmanship Community where he supports craftspeople with professionalizing and sharpening their skills, but also reflect on their current practices and how they can work better as teams. At #itakeunconf he will be sharing about Remote Pair-programming. I think the most important thing that shaped my career has been the Software Craftsmanship movement. I first went to an OpenSpace in 2012, then Coderetreats, then SoCraTes, then organizing OpenSpaces and such. The community has really supported me and helped me grow in every professional aspect I could think of. The most challenging part of working remote is keeping an inter-human connection to the person on the other side to make up for the tools that so rarely work. It also helps to use the least-broken tools and find a structure that works for the individuals that want to pair up. 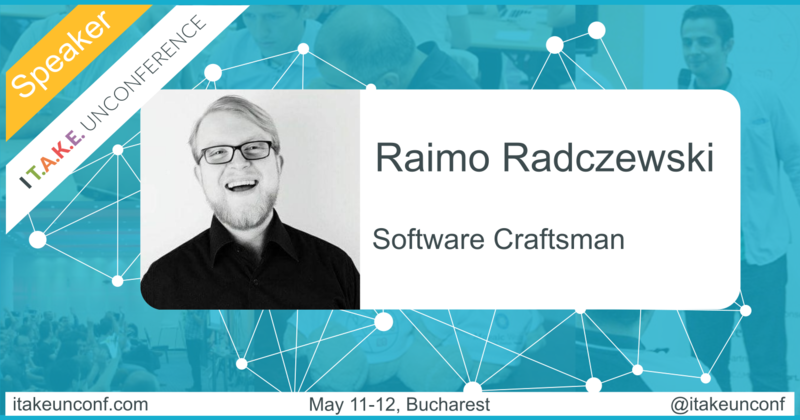 Want to join Raimo and ~300 software crafters from around Europe?